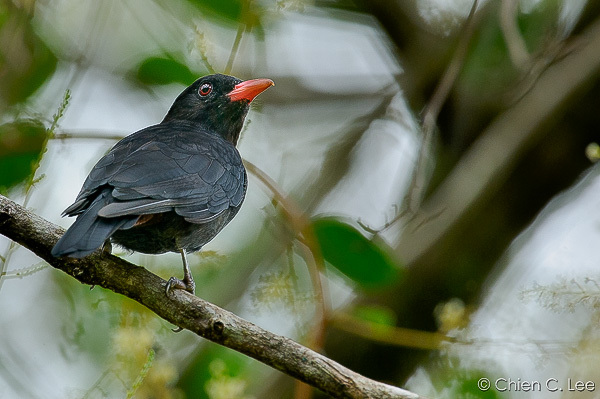 If you are planning to go to Sarawak any time soon, why don’t you make time to go bird watching while you are there? 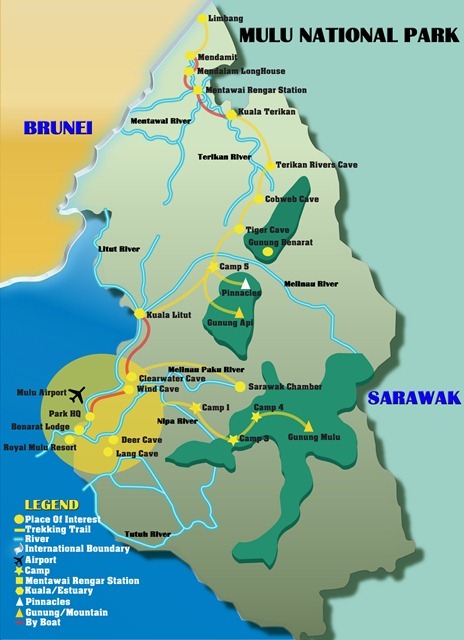 Sarawak has a lot of destinations where you can do just that! 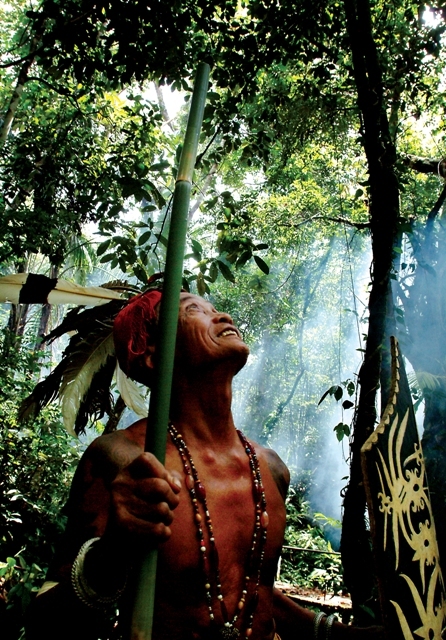 Sarawak, the legendary land of headhunters and hornbills, is the largest state in Malaysia. This state occupies the north-western portion of the great island of Borneo. Here, the ever wet rainforests reach unparalleled diversity and are home to various kind of tropical wildlife and animals. 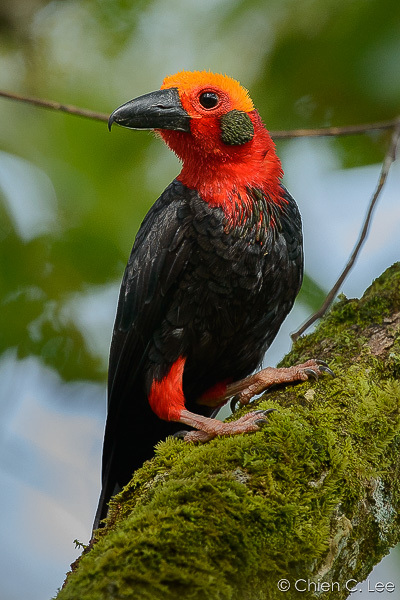 A great portion of Borneo’s 650 bird species have been recorded in the state, including most of the island’s endemics such as the bizarre Bornean Bristlehead. 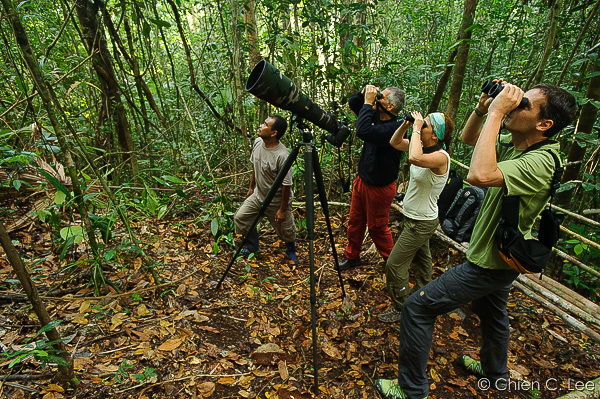 Sarawak offers superb birdwatching opportunities as it holds the highest number of national parks and nature reserves in the country. These range from balmy lowlands and shorelines to cold mossy forests at the summits of the higher mountains. Kuching is a logical place to begin your birding adventure in Sarawak with an international airport and good roads are being well-provided. There are numerous nature reserves within an hour drive of the city that offers you a variety of bird watching opportunities. One of the most popular park is Kubah National Park, which has beautiful lowland rainforests and has a great variety of birds. 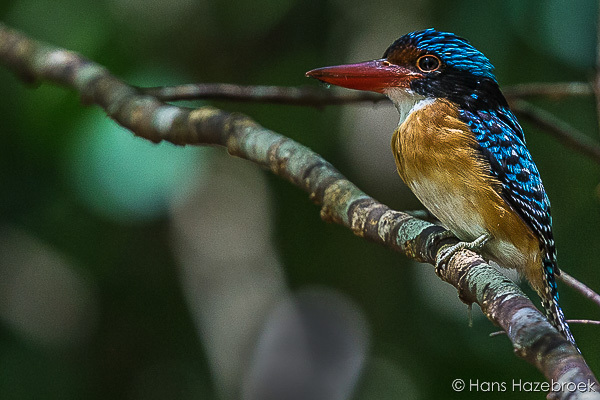 A number of endemic species for example Bornean Banded Kingfisher, Bornean Wren Babbler, and Blue-banded Pitta could be found here. Next is Santubong National Park. It is located near the coast, with its rugged sandstone terrain and tall rainforests. This is the closest site to Kuching which offers you a chance of seeing Rhinoceros Hornbill, one of Sarawak’s most emblematic birds. It is also a protected species. Semenggoh Wildlife Rehabilitation Centre, although better known for its population of reintroduced orangutans, is also an excellent bird watching destination that hosts many lowland birds, including the rare Long-billed Partridge. Further south, near the Indonesian border, Borneo Highlands comprises a range of forested hills culminating in Mount Penrissen at over 1300 m in elevation. 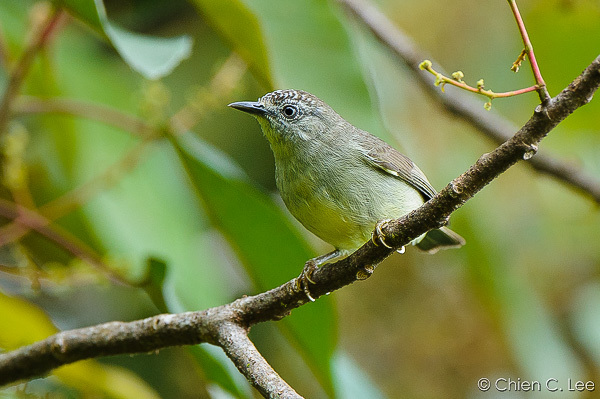 This area gives you the chance to see some of Borneo’s endemic submontane birds, including Pygmy White-eye, Chestnut-crested Yuhina, Bornean Barbet, and Mountain Serpent-Eagle. Other than Kuching, you could also fancy bird watching in Miri. A UNESCO World Heritage Site, Gunung Mulu National Park is Sarawak’s most famous park. Mulu is incredibly biodiverse and hosts a wealth of rare flora and fauna, although being well known for its amazing limestone cave systems. The entrance to Deer Cave is an almost guaranteed site for the Bat Hawk, especially at dusk when up to 1.8 million Wrinkle-lipped Bats emerge from the cave. 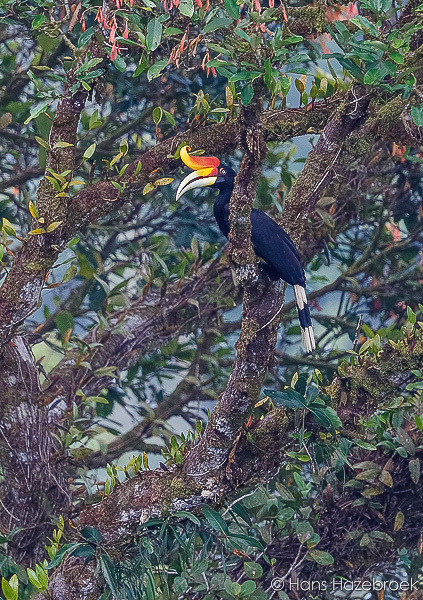 Mulu has an eye-catching bird list of 262 species, which includes all eight species of Bornean hornbills, and over half of the island’s endemics such as Fruithunter, Hose’s Broadbill, and Whitehead’s Spiderhunter. Montane specialties can only be seen via a multi-day trek to the upper slopes of Mount Mulu. 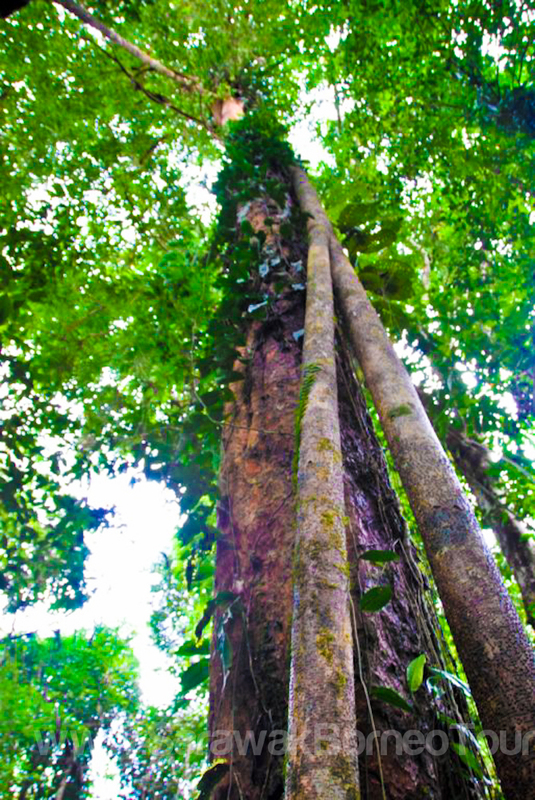 Pulong Tau National Park is Sarawak’s largest reserve, comprising nearly 600 sq. km of pristine montane rainforest. This national park occupies the western flank of the Kelabit highlands. Its spectacular mountain landscapes include Mount Murud, Sarawak’s highest peak (2,424 m), and Tama Abu range. The main villages, Bario, Ba’ Kelalan, Long Banga and Long Lellang, can be reached by flights from Miri, or alternatively, by four-wheel-drive vehicle. More than 300 species of birds are listed in this park, including the rare endemic Bulwer’s Pheasant and Black Partridge. 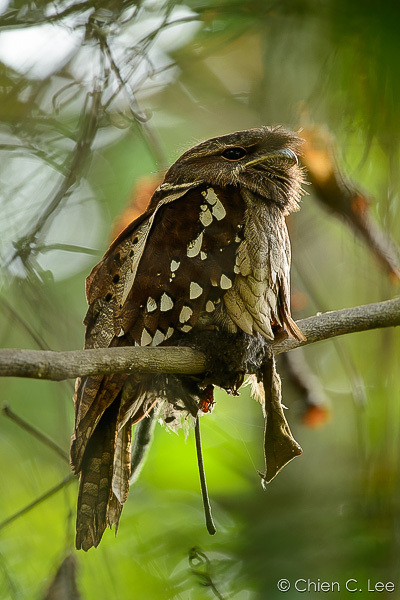 Pulong Tau National Park has a broad altitudinal range and habitat diversity, and is home to numerous other endemic species including Bornean Whistler, Mountain Barbet, Whitehead’s Broadbill, and the enigmatic Dulit Frogmouth. 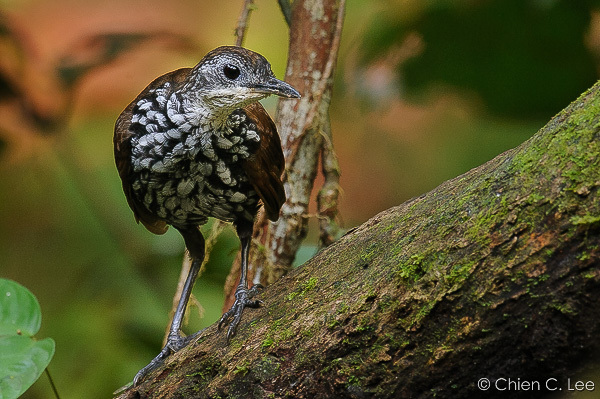 In the far north of Sarawak in Ulu Trusan region, the mountainous Payeh Maga IBA is one of the state’s most promising new birding destinations. You can get there by four-wheel-drive vehicle from the town of Lawas, and while day hike into the forest is possible, you should be prepared to camp in mountain shelters if you wish to spend more time at the higher elevations. 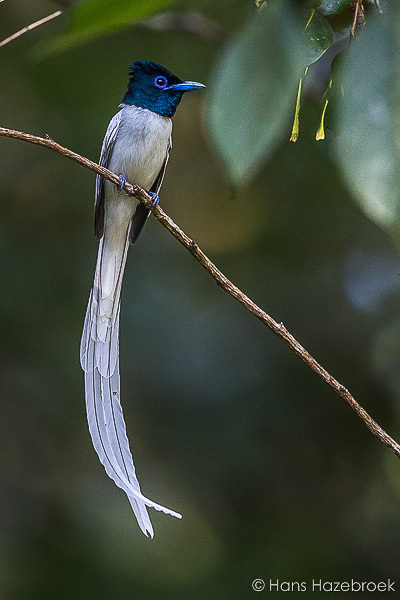 Special attractions here that you could also check out include Bornean Frogmouth, Bornean Leafbird, Bare-headed Laughingthrush, and the recently rediscovered Black Oriole. At the coastal areas, you could spot waders and other water birds as Sarawak offers excellent wintering grounds for those species along its extensive coastline. The globally Vulnerable Chinese Egret often congregates in significant numbers in the Bako-Buntal Bay with possibly the largest concentration of the species in Borneo. Buntal, a fishing village less than an hour’s drive from Kuching, gives access to part of this coastal region. 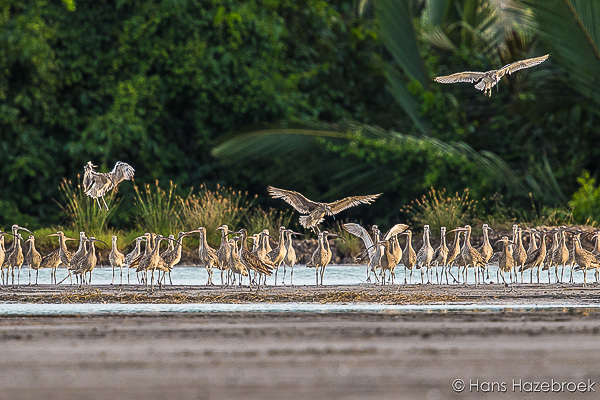 Spectacular congregations of large waterbirds such as the Far-eastern and Eurasian Curlews are not unusual in the Bako-Buntal Bay in the wintering months, which is usually the rainy season in Sarawak. Some 55 species of water birds, including the Pacific Golden Plover (often seen in its beautiful breeding plumage) have been recorded here. You could also enjoy seafood meals while you are there in Buntal! How about that? Are you excited to go for an adventure in Sarawak now? Check out our website for different types of great tour packages that we offer you and book your tour with us now or you can email us for a customised tour at here. Kuching City, the capital of Sarawak is a beautiful city with varieties of secrets. One will never know not until landed in Kuching itself. Located at the Main Bazaar Street opposite Ghee Hoe Hin is a mysterious looking newly opened shop. 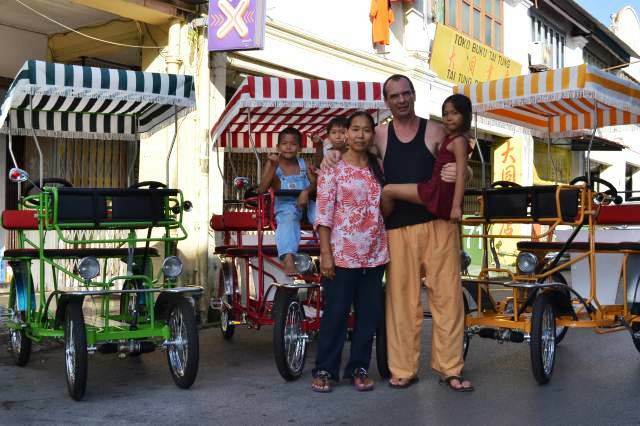 This week in the beating heart of Kuching City itself, I had an exclusive interview with the Surrey Bike owner. Mr Gerald Loew: Good afternoon. Melvin: My name is Melvin and I am from Kuching itself. I heard of your newly opened Surrey Bike shop so I would like to know more about it. But first may I know a little bit about you? Mr Gerald Loew: My name is Gerald Loew and you can call me Gerald. I am 48 years old and this is my lovely personal assistant. She is my wife. Her name is Mrs Maizan or you can call her Maizan age 38. So, what would you like to know? Melvin: For starters, where are you from? Mr Gerald Loew: I am from Austria itself and my wife here is from Kelantan. We moved to Indonesia for about one and half years ago. We opened up a small clinic and decided to do it for free to help needy people. We used traditional medical methods to treat our patient. Melvin: So what makes you and your family decided to come down to Kuching and take up the task? Mr Gerald Loew: We heard that there are people in Kuching who needed our services so that was when we decided to get out of our comfort zone and do something new. Melvin: What about the three lovely looking bicycles displayed outside? What are your concepts or ideas behind it? Mr Gerald Loew: Our main idea for the bicycle is for health reasons in the first place. People in this world today, have been using motorbikes, cars and other means of public transports are not in a very good health condition. So, we started the idea with the thought of helping society, by giving them a healthier lifestyle to go around Kuching. What other better ways to view this beautiful city? 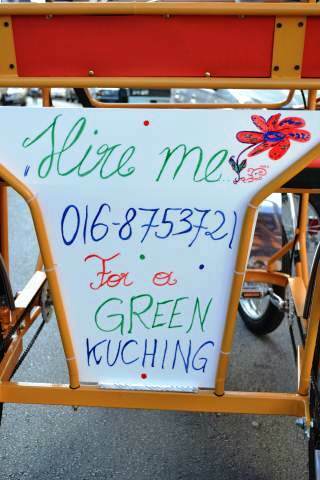 Besides, we do believe by cycling it also helps to save the environment and creating a greener Kuching. Melvin: When you first opened this shop, has it ever occurred to you that people here will mistook it as a rickshaw? Mr Gerald Loew: It happened several numbers of times when we first opened it. It was normal to us. Melvin: Can you tell us a little bit more about the Surrey Bikes? For an example, its weight and how many people can sit in it? Mr Gerald Loew: Sure! Would love to! These very popular trends of Surrey Bike originated from Austria, weighs at least 130 kilograms for the bigger size. The smaller size is at least 80 kilograms. The bicycle is unlike your ordinary two wheeled type. It comes with a roof, comfortable leather seats, brakes and steering wheel to go around. It is like driving a car. 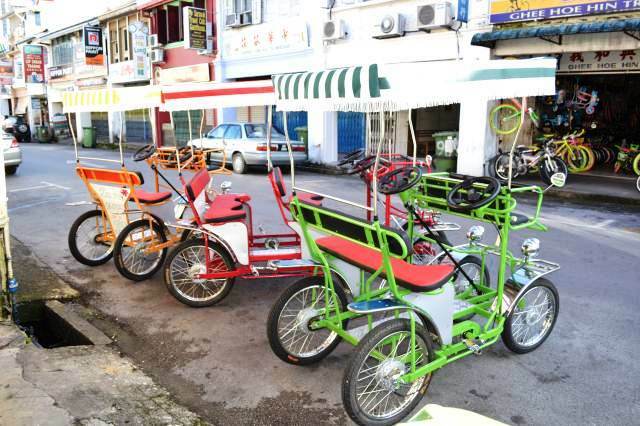 Currently, Mr Gerald Loew owns only three of the Surrey Bikes in Kuching which comes in traffic light colours. The bigger size can carry up to four adults and two kids, while the smaller ones which weights at 80 kilos can carry 2 adults and 2 kids. Having a Surrey Bike is a good way for families or couples to go around. Melvin: What is the cost like for one? Mr Gerald Loew: The two smaller units cost RM 7000 while the bigger ones, like that red one over there is at least RM 8000. Melvin: Do you have further plans for these three bikes of yours? Mrs Maizan: My husband was suggesting to me that we can put up head lights on the bike. So that, tourists and public does not only ride it during the day but during the night as well. And perhaps a little bit in future, we have ideas on putting up a simple radio so that when they ride on it, at least they have some entertainment. Melvin: Do you use it to fetch up your kids? Mrs Maizan: Yes we do. Our children enjoy the ride a lot. Even when their classmates wanted to try it out. So we told them to just hop in and give them a short ride. 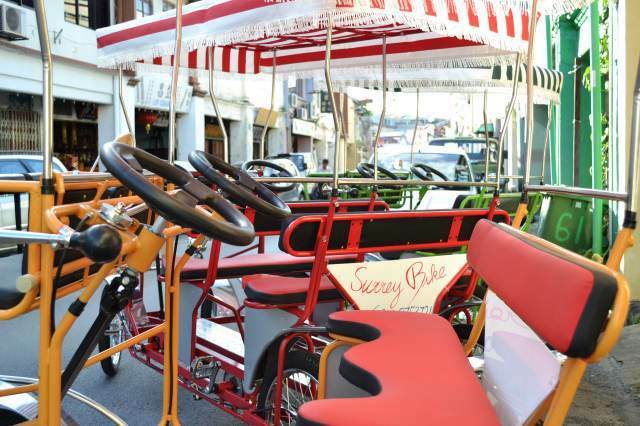 Melvin: How much is the rental for these three Surrey Bikes? 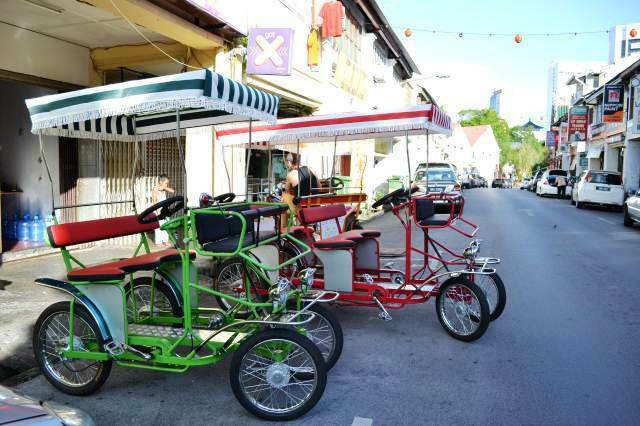 Mr Gerald Loew: The red Surrey Bike which is slightly bigger than the yellow and green is at RM 25 per hour while the other two is at RM 20 per hour. Melvin: Do you have any future plans for your Surrey Bike business? Mr Gerald Loew: Yes we do. We are planning to expand the Surrey Bike culture and would like to do it at my wife’s hometown in Kelantan. It will be interesting to see people in Malaysia trying something new. Melvin: I see. Well, our interview comes to an end and I would to give my personal thanks to you for allowing me to interview you personally and see how does this Surrey Bike works. Mr Gerald Loew: You’re welcome. Would you like to try it for yourself? The Headhunters’ Trail is definitely the most complete way to explore Gunung Mulu National Park. Considered as one of the best trekking path in the whole of Borneo, the Trail is a must of those who wish to see the whole of Mulu National Park comprehensively, and also Northern Sarawak. Once, when headhunting was practiced more than a hundred years ago, Kayan warriors from Baram foraged through the Mulu area to attack the Murut longhouses and Chinese settlers who lived along the Limbang River. Those fearsome war parties paddled their boats up the Melinau River up to the Melinau Gorge, before dragging the boats overland for 3 km towards the Terikan River. The so-called ‘Kayan Road’ where the boats were dragged was a 4-metre wide trail, having poles laid across the path, is now called ‘Headhunters’ Trail’. A trek along the Trail would be of high preference for those who wish to ultimately challenge their muscles, as well as those participating in a teambuilding trip. Mulu National Park can be reached by air from Miri or Kota Kinabalu, and upon arrival at the Mulu Airport, visitors would be transferred to their Benarat Inn for lunch. 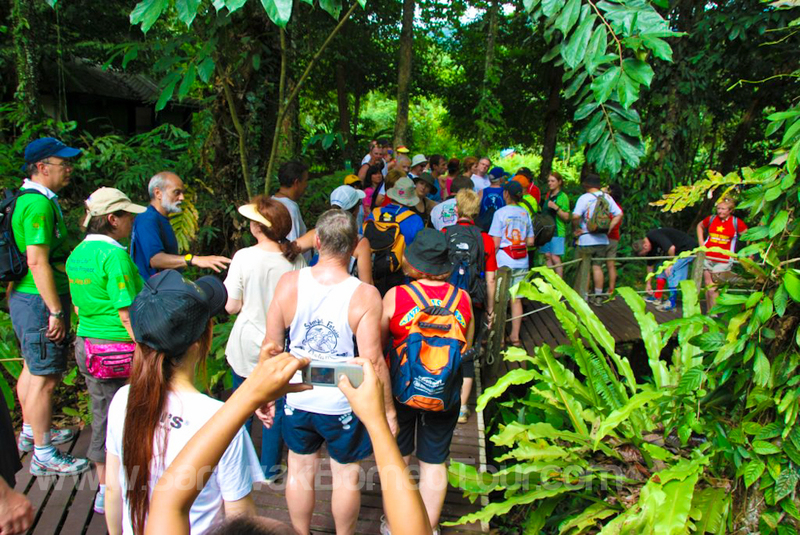 After lunch, they would be led for a 45 minutes walk to visit the Deer and Lang Caves via the plankwalk. more than 5 million bats. Here also visitors can witness one of the most popular attractions in Gunung Mulu National Park, the wonderful display of the bats coming out in waves from the cave as they move towards the jungle to hunt for food at night. Visitors then would return to the Mulu National Park headquarters in early evening, and be transferred by van back to Benarat Inn for dinner and a restful slumber. Day two would start just after breakfast, and visitors would be brought by boat to the source of the Clearwater River for a visit to the Wind and Clearwater Caves, another two of the famous Mulu caves. Lunch would be at the Clearwater Spring, and then visitors would be transferred by boat to Long Lutut. They would then have a 3-hour trek through the lowland jungle to Camp 5, a very basic accommodation for the night. And in rather basic conditions, visitors would enjoy dinner and then sleep. 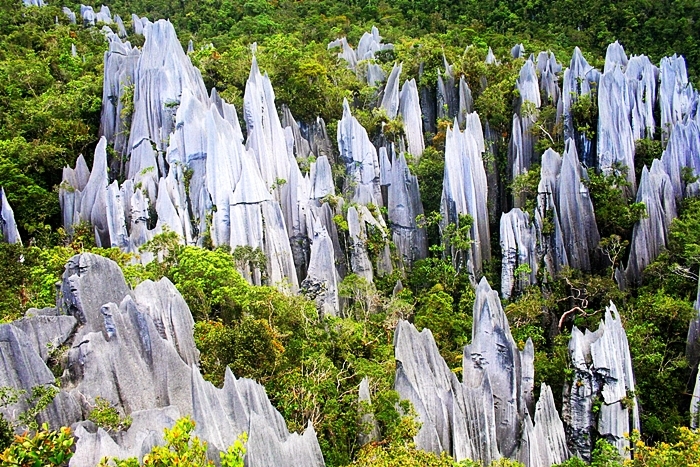 The breathtaking Mulu Pinnacles of the Gunung Mulu National Park beckons visitors on the morning of the third day. After breakfast, visitors would make the climb to Mount Api, and during the ascent, they could see how the vegetation changes as big trees gradually give way to bushes and plants such as rhododendrons. Reaching the top, visitors could enjoy their packed lunch while admiring the brilliant view across the Pinnacles towards the Brunei Bay. They would then move down to Camp 5 for rest and dinner, and a well-deserved sleep. Some trees could be a thousand years old. Once breakfast for the fourth day is completed, visitors would then move along the Headhunters’ Trail, crossing through two rivers to reach the both at Kuala Terikan. From there, they would go down the river to the Iban longhouse. They would spend a night as guests there, in basic conditions without much comfort, but providing the first-hand experience for the Iban lifestyle and their customs. Visitors could expect to sleep on simple mats on the ground, and having their own sleeping sheets would be very helpful. The Ibans are rather a very friendly group of people, and are generous to share their traditional music and dances. The Ibans are rather a very friendly group of people, and are generous to share their traditional music and dances. Morning of the fifth day arrives, and visitors would bid their Iban hosts and friends goodbye, before making their journey home to Medamit by boat. From Medamit, they would travel by land to Limbang airport before taking the flight to Miri, and those going back to Kota Kinabalu would be transferred by boat to Labuan, before reaching Kota Kinabalu. Visitors exploring the Headhunters’ Trail should be prepared by having the usual essentials such as long sleeved shirts and pants, T-shirts, water bottle, towel and toiletries, torch light, raincoat, sun lotion, and of course, a bed sheet and a pair of good trekking shoes.